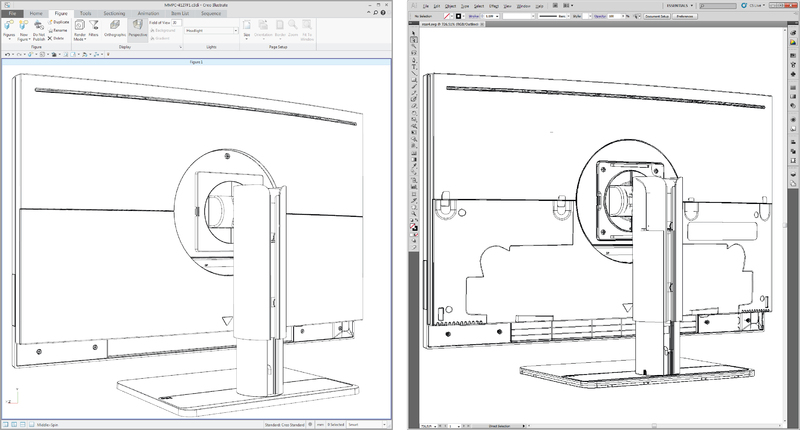 When saving figures as illustration (SVG or CGM) from Creo Illustrate (3.1 and 4.0), I expect that the final SVG export is an identical representation of what is shown in the graphics area of Creo Illustrate. In my case however, certain paths (not all) of underlying parts become visible in the final SVG export while these are not visible in the Creo Illustrate graphics area. I tried playing around with the different export options (Thick/Thin lines_Surface borders_Enhanced intersections, Segments_Polylines_Beziér paths, ...) but no difference. There are also no phantom parts in my model. The issue is very frustrating, because the published pdf or svg doesnt look good. The problem is about resolution and not about lines layout. The issue is also visible in figure viewing area when you zoom your model out. To resolve that you MUST choose a page size before you start working in the model. I always use A4. Then you can adjust the resolution when exporting the figure, i use to use 200 pixels per inch, it gives me a sharp picture and not a big file. Remember always to center the model in the page size. Thank you!!! We found that only some file types were affected. If you are saving as an .idr, the file translates just fine when opened in isodraw, but final output types showed the underlying parts. Thanks again!